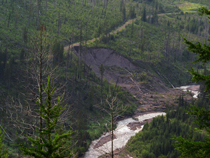 Our Spring 2015 newsletter provides a bit of background and 7 points we'd like you to consider making in your comments on the Proposed Revised Flathead Forest Plan by May 15! It also invites you to join us for an inspiring Wilderness Slide Show and Book Signing by Frederick Swanson on May 13! 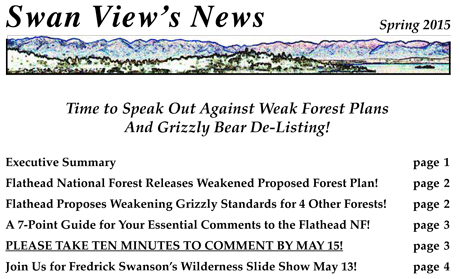 You can use the PDF version of the newsletter to cut and paste your comments to the Flathead, or you can CLICK HERE to download, print, sign, and mail a FORM LETTER! You can also click here to listen to our Montana Public Radio interview on why these comments and bold, science-based proposals like our Citizen reVision are so important! Please DONATE NOW to help us continue digesting 500-page federal documents into short newsletters and single-page action alerts!